I am passionately obsessed with the next great photo. I don’t just want the next great landscape, I want wildlife in its natural environment. The most prized photo that I am after is of the Endangered Florida Panther. I have seen the panther several times over the past 4 years, and have even reported it to the Florida Department of Fish and Wildlife. I am not the only one to have seen this beautiful creature so I’m not hallucinating, my neighbors have as seen it as well. I suppose we could all be drinking the same hallucinogenic water. I could hear the disbelief in the tone of the ranger’s voice, he certainly didn’t believe I saw a Florida Panther. Perhaps it’s his disbelief that makes me want to photograph the Panther, no…it’s more than that. Yesterday, I went hiking/photographing on the trails with our new neighbors, the Layne family. We hiked through some pretty wet trails, well, actually more than wet, knee-high to thigh-high water. Everyone (especially non-native Floridians) can agree ahead of time, it’s pretty stupid to hike through deep fresh water in Florida. I mean it’s just something you don’t do! I just don’t want to be on Good-Morning America’s headlines “Lady bitten by an alligator, had to hike out without leg”, nope, not something I want. So how did we end up hiking through thigh-high water…it just happens! You think, well it can’t be deep for very long, it looks dry “just up-ahead”. So you hike through it. Then you realize you have to keep going, or go back the way you came. Inevitably, 90% of the time you choose to go forward through the unknown, because you hope that it’s better than what you came through. It’s that hope, that forward is better, that sometimes gets you into “thigh-high trouble”! We endured over 15 minutes of deep water in the midst of sun around us, but rain upon us, literally! 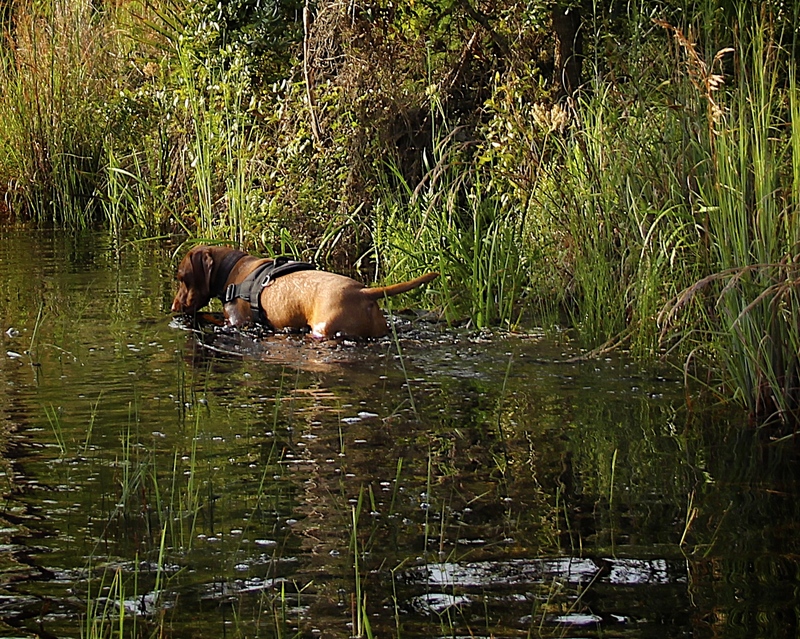 Winston, my shadow, my Vizsla, was having an amazing time. We finally came upon soggy, sandy ground on the outer rim of the park. I had to put my camera in the bag due to the rain. We continued hiking when we noticed all kinds of animal tracks. 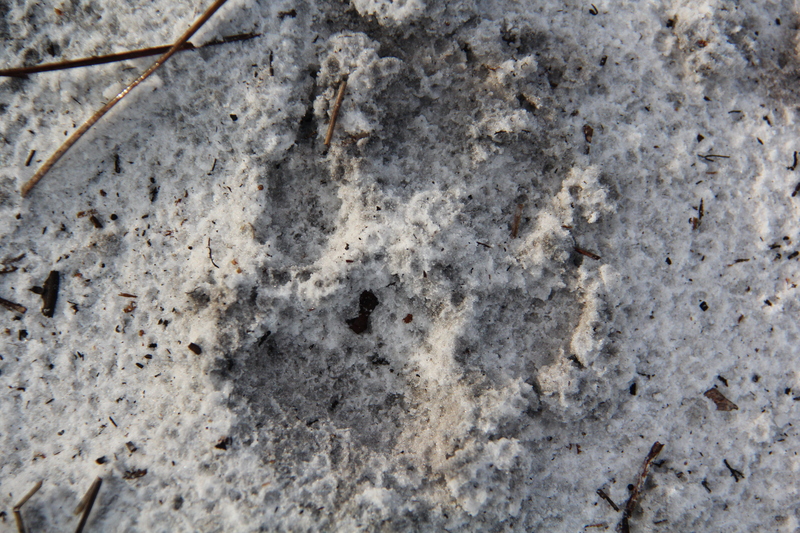 We saw fresh pig and coyote tracks…and something else. It definitely looked like a “cat” print, but the size was astounding. I pulled out my measuring tape and my neighbor’s son snapped a few pictures. The print measured over 3 1/2″ in length. I quickly pulled out my camera and snapped this photo…no doubt in my mind, it was a panther track. I so wished I would have stayed and taken more photos, documenting more evidence…but I didn’t. Perhaps the fear of walking through alligator infested waters affected my thinking…I don’t know, sounds logical to me. Next time, if there is a next time, I will be prepared. I will document with a length and width measurement, I may even make a cast of the print. Ok, I know will make a cast of the print..I’m adding plaster of paris to my list of supplies to hike with. Epilogue: I went hiking this morning to the same location. (Why? To take the photo I missed yesterday) I took a different route and only had to hike through small section of muck, mud, and brackish water. Half way through the muck, mud, and brackish water a large animal moved quickly from the bank to the small creek to our right. My heart skipped several beats, because the only thing that large, could only be an alligator. My fears were confirmed, there are alligators in this park. And you know the only thing worse than walking through the first time, is knowing you have to walk back through this very muddy, murky, brackish water a second time, right by that gator you just passed. This is when I began to think I may be slightly crazy…at what point does your passion, your obession lead to out right stupidity. That is the question? Winston and I continued on..our senses heightened almost expecting to see the panther, wanting to, but not wanting to, half hoping to, half hoping not to. Slowly, quietly we walked, looked, and listened. We found prints..but the panther prints were gone. What little rain we had, had washed them away. We continued hiking without incidence, but adding in the thrill of one rabbit chase. All fun aside, it was now time to walk back through that murky, mucky, brackish water. I held Winston by the collar on my right side, the creek and gator were on my left side. (Who am I joking, the creek now extended over the path…mud, muck, brackish water, and creek, one and the same) Praying… I looked unappetizing to the Gator and too big to tangle with; (P.S. Dog is a gator’s favorite food). We made it, or so we thought. Up ahead turning the corner was a man. I might add, Winston loves people! I wouldn’t have been concerned at all, except for Winston’s strange reaction. Winston turned to bolt back the way we came. (Alligator behind versed unknown man ahead,) Winston was afraid! I didn’t like my choices, and Winston clearly preferred the Gator) We stopped. Winston had been panting hard a second ago, it was a hot morning. He stopped panting, I couldn’t hear him even breath. He didn’t want to be heard, that was obvious. He didn’t want to alert the man. My heart was beating fast, (now I’m thinking I’m am certifiably crazy for being out here). We both held our breath, I pulled out my Tazor, and watched the man turn the corner, we waited a good 10 minutes before we continued forward, walking slowly and quietly the whole way back to the car. By time we got back, we both wanted to go home. I am thankful that I don’t know what is “just up-ahead”. I most likely wouldn’t leave my house. I definitely am thankful Matt and I haven’t known what is “just up-ahead” with the progression his disease, ALS. Will I go back out? Yes,…there’s another great photo, “just up-ahead”! So enjoyed your pictures and writing. I actually found myself holding my breath when you were walking in the water and your dog came back and no huffing and puffing just quiet for what was ahead. Then you walked out and away. Phew. Scared me!